These temporary masking materials cure using either UV light or dry in ambient air, and can be removed by peeling, dissolution in water, or incinerating after the part has been processed. Our masking products are used in the electronics industry for masking during soldering or conformal coating, and the metal finishing industry for masking precision parts during etching, plating, peening and many other processes. Liquid temporary mask can be applied using dispensing equipment, from simple hand-held machines to fully automated systems, allowing repeatability and accuracy. Replace tape, wax, lacquers and fixtures with DYMAX SpeedMask temporary masking resins, which offer reliable protection against most metal finishing processing environments. 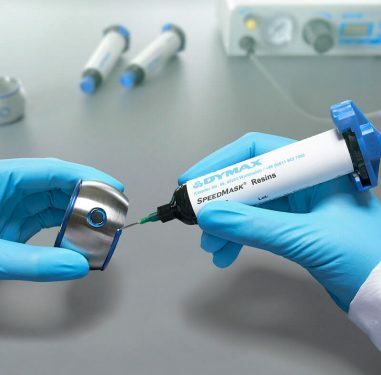 DYMAX one-part masking materials are fast curing, solvent-free resins designed for manual or automated masking of printed circuit boards, prior to wave or reflow soldering operations, or conformal coating. Techspray TEC2211 Wondermask© P is a temporary, peelable solder mask or resist comprised of a thixotropic, synthetic acrylic latex designed to withstand fluxing, wave soldering, and cleaning operations.